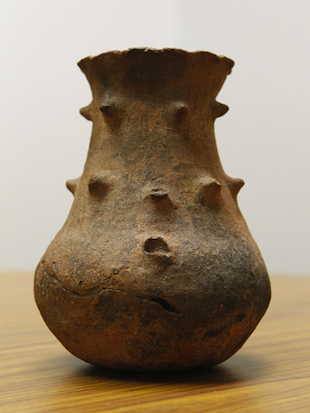 A piece of pottery given to Goodwill by an anonymous donor may in fact be a prehistoric artifact taken from a Native American burial site in Oklahoma. The Buffalo News reports that the mysterious piece of pottery traveled through Goodwill's internal distribution system before arriving in New York. Employees at Goodwill had no knowledge of the item's potential significance and put it up for auction, where it received two bids for just $4.99 before several readers pointed out its potential historical value. A note inside the 7.5-inch piece of pottery reads, "Found in a burial mound near Spiro Oklahoma in 1970." "We're pretty amazed that the thing wasn't (a) broken or (b) just thrown out," Jeremy Juhasz, Goodwill's local social media and website coordinator, told the Buffalo News. Local New York affiliate WKBW says Goodwill has received a number of unintentional, high-value donations over the years, including a book written by Albert Einstein in German and an autographed copy of Mickey Mantle's book. It's thought that the piece originates from the Spiro Mounds archaeological site in Oklahoma, meaning it could potentially be several thousands of years old. According to the Oklahoma Historical Society, the site was a permanent settlement from approximately 800 to 1450 but that people have inhabited the area for 8,000 years. Goodwill says it is returning the piece to the Caddo Indian Nation. "Once we were alerted to what it was, there was no doubt that we were happy to donate it back to them," Juhasz said. Last November, a man donated an old suit to Goodwill, only to realize later that it was the same suit in which he had hidden his entire life savings by sewing the money into the suit's seams.